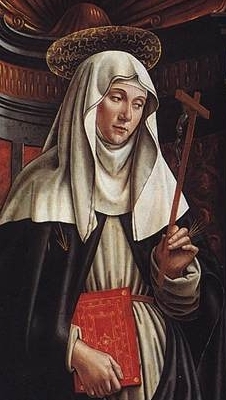 Today is the feast day of another of my favorite saints, more so now than ever: St. Catherine of Siena. Siena also happens to be one of my top two favorite towns in Italy, I loved it there! This entry was posted in feast day, liturgical year, patron saints by coffeemom. Bookmark the permalink. >I love that quote, it's true now matter how big or small your fire. And I love that last image, how beautiful. Are you getting ready to grow your garden? >Ah, Christine, the garden… pondering…scaling back. Got basil and herbs in tho and they are going great guns, always wonderful. A peony is beginning to bloom, my roses are sadder than sad maybe dead idk…and I"m thinking of turning the raised beds over to kiddos and just tend a few tomato pots. A busy summer ahead, intense….so I am feeling I might need to pull back..HTanks for asking tho….I'll post when I get really into the mucking about in the dirt. How bout you? or is it just the chicks now? I pray this is true of me.